N'FINITY. Wine Racks Made Simple. In our effort to create the racking kits you always wanted, Wine Enthusiast has developed N'FINITY Wine Racks—a collection many designers say looks even better than custom racking, though it is offered at a fraction of the price. One 12-bottle tier with an angled row for displaying 4 bottles. 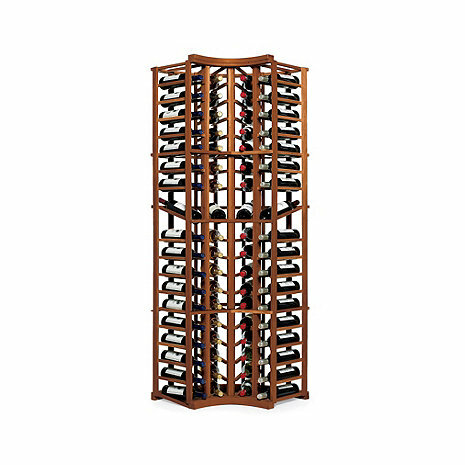 N'FINITY wine racks offer both the beauty and richness of furniture-grade decor pieces and the lasting durability of a quality wine storage system. Solid Mahogany makes it possible. Choose from a hand-applied Natural Finish or Dark Walnut Stain. Clear coated. Hidden pre-drilled fasteners make assembly easier, leaving no unsightly screws or holes in the most visible areas. No nail gun or putty needed. Base and crown moldings (included) provide a more finished "custom" look. Assembly instructions and hardware included. Rubber mallet, Phillips screwdriver, and nail gun (not included) required for assembly. Nail gun needed only to apply optional face trim. Assembly time varies depending on the racking kit you purchase and how handy you are putting items together. Need help? Call our Wine Storage Consultants at 800.377.3330 for a FREE consultation. Want to create a wine cellar with N'FINITY Wine Racks? Send us a preliminary wine cellar sketch via email or fax. Then call us. We'll design your wine cellar—a $99 value—for FREE! What is the measurement from the corner to the edge of the rack on each side? BEST ANSWER: 24" both directions but you should plan on 25" just to be safe. 25" from the corner to each wall. Challenging but what else is there? I purchased 2 corner units, 2 3-column display units, 1 solid diamond cube unit and 1 half height with table top to remodel our wine storage closet. All of the units arrived timely in great condition after shipment from NY to OR. The finish is fantastic. All of the units except for the corner units are high quality, assembled well and look great. Well worth the price. If I could have a do over, I would not buy the corner units. Although they are somewhat difficult to assemble, I could deal with that. The problem is they do not match the quality of the other units. I cut the curved trim in the middle to assemble so they would not crack because the curve did not match the curve of the rack. That results in a small gap in the center. In addition, the stain on the top and bottom trim pieces does not quite match the rest of the dark walnut color due to possibly being a different type of wood. These trim pieces also did not match up well with the vertical supports resulting in a few gaps where I could not use screws. It's OK but does not result in matching the quality of the other units. If I were to do over I would order more 3 or 5 column display units instead of the corner units and install them as corner units by matching the front corners together at a 90 degree angle. There would be wasted space in the corners but the units would look a lot nicer. I think Wine Enthusiast had a great idea with these curved corner units but can't produce the quality they could with the other units that only have straight lines. Just so I am clear, I would give the highest rating to all the N'finity units I purchased except for the corner units. Instructions are inadequate; difficult to assemble; pre-drilled holes sometimes do not line up. The pre-drilled holes are too small for the screws included and creates splitting of of the wood. There is an inconsistency in the amount of screws noted in the instruction booklet versus what was needed.